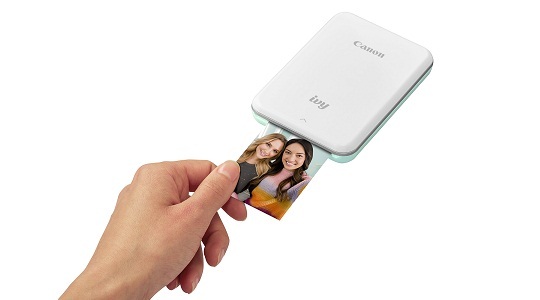 With just on-par output quality, print speeds and running costs for a zink-based photo printer, the Canon's IVY Mini is one of the best portable printers that churn out 2x3 Inch photos. The Canon IVY uses ZINK photo paper which is constructed with peel and stick backing. The prints themselves are smudge free, water repellent and tear resistant making your photo work almost perfect. Even earlier Polaroid cameras do the fresh prints in a couple of minutes but unfortunately, that method means you are never going to be able to use your favorite photos or even best shots. You are ultimately at the mercy of fate as you take your best shot next time. Mini portable printers solves that issue very well. You can dig up your favorite selfies, or take your time and shoot a dozen pictures to find the one you like best. Once selected, you can print them instantly. IVY is Canon's smallest and lightest printer yet.